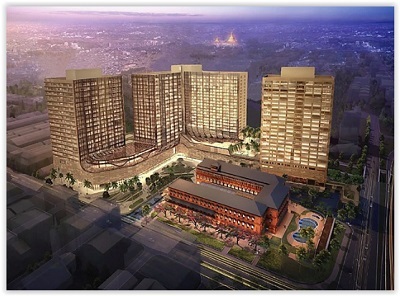 TOKYO, July 12, 2016 - (JCN Newswire) - Mitsubishi Corporation and Mitsubishi Estate Co., Ltd. are pleased to announce the July 12 signing for the Landmark Project, a large mixed-use redevelopment in Central Yangon, Myanmar. The Project will be developed with Yoma Strategic Holdings Ltd. and First Myanmar Investment Co., Ltd. (FMI). Both Yoma and FMI are affiliates of Serge Pun & Associates Ltd. Group (SPA Group), a major Myanmar-based conglomerate. The Project entails redeveloping four hectares, where the SPA Group had constructed and operated an office building, commercial facilities, a hotel and other real estate assets, with two office buildings, one condominium, one building combining a hotel and serviced apartments, with commercial facilities being installed on the lower floors of each building, across a total floor area of over 200,000 m2. Mitsubishi Corp and Mitsubishi Estate will form a joint venture set up in Singapore for implementation of the Project. The Project will also benefit from a preferred equity investment by the Japan Overseas Infrastructure Investment Corp. for Transport & Urban Development (JOIN). Total investment by the Japanese Partners is up to approximately USD 200 million. JOIN was established in October 2014 through public and private sector equity participation with the aim of facilitating urban and infrastructure development by Japanese corporations overseas. The Project will be JOIN's first equity participation project in the field of overseas urban development. The Japanese Partners will work with Yoma and FMI to establish a local project company. The Asian Development Bank (ADB) and the International Finance Corporation (IFC) will also make equity contributions, and the Local Project Company will borrow project funds from these two financial institutions to finance the Project. Myanmar made the transition to democracy in 2011 and is proactively promoting economic growth through market liberalization and attracting foreign investment. With the arrival of the new administration in April, more rapid development is expected along with greater need for supporting social infrastructure. The Project will take place around Yangon Central Railway Station, the city's main downtown business and commercial district, the equivalent of Marunouchi in Tokyo. Given its size and mixture of land uses, the Project will not only provide infrastructure to support Myanmar's development, but will also, quite literally, become a landmark in downtown Yangon. The Project will combine the real estate development know-how that Mitsubishi Corporation and Mitsubishi Estate have accumulated around the world along with Japanese high tech and product planning capacity with the SPA Group's extensive experience in the real estate business in Myanmar. This will allow for high value-added urban infrastructure and related services, which, it is hoped, will contribute to rapid economic development in Myanmar.